In November 1992, right before Bill Clinton defeated George H. W. Bush, Grover Norquist published a lengthy article in the American Spectator predicting the horrors a Clinton presidency would usher in. Norquist focused his attention not on the usual conservative bugbears — stagflation, big government, liberal judges — but rather on what he was certain would be a massive, sustained Democratic campaign to use the power of government in order to entrench Democratic control. Norquist rattled off a long list of actions he predicted Clinton would undertake: use the IRS to crack down on conservatives, unleash government organizations to engage in politicking, register legions of new voters (“not necessarily citizens”) at welfare offices and prison induction centers, grant Senate seats to the District of Columbia and perhaps Puerto Rico and the Virgin Islands, and, of course, unleash a wave of compulsory unionization. Clinton never attempted any of these things, of course. But Norquist’s fever dream was a useful window into a poorly understood aspect of conservative thought, which is an obsession with the ways in which the power of government can be used to help the governing party maintain its own power. Norquist’s ill-founded suspicions of the Democrats was merely a failed attempt to mirror-image project his own operational mode, which is widely shared among movement conservatives. It was the driving force behind the Bush administration’s failed 2005 campaign to privatize Social Security, which conservatives widely and gleefully predicted would, if successful, bring tens of millions of Americans into the “investor class” and thus transmute them into allies of capital rather than labor. This is the same mentality at work in numerous states where Republicans, having gained power in the 2010 off-year election wave, have invested their political capital in legal changes designed primarily to tilt the future playing field in their party’s favor. That is the basic purpose of the wave of laws to make voting less convenient (Democrats being more heavily represented among sporadic voters) and to crush unions. As much as Republicans detest unions as economic actors, they hate them far more as political actors, organizing significant minorities of voters as discrete voting blocs aligned with the Democrats. 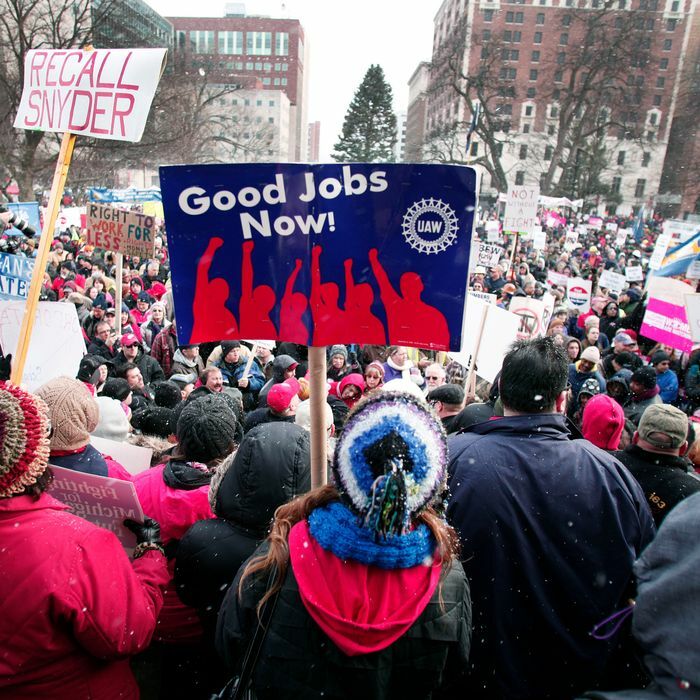 This is the best way to understand the Republican party’s sudden attack on unions in Michigan. Last year, the Michigan director of Americans for Prosperity, the right-wing activist group, explained, “We fight these battles on taxes and regulation but really what we would like to see is to take the unions out at the knees so they don’t have the resources to fight these battles.” Republicans understand full well that Michigan leans Democratic, and the GOP has total power at the moment, so its best use of that power is to crush one of the largest bastions of support for the opposing party.